The Peyton Manning Children’s Hospital (PMCH), St.Vincent Indianapolis has a dedicated Pediatric Radiology Department, ACR and Joint Commission Accredited. The onsite Pediatric Radiologists and Radiology team understands the unique needs of children who may be anxious about getting a medical image taken or radiology procedure. This department is next to the Hilbert Emergency Department at PMCH and works closely with emergency medicine physicians, pediatric specialists and surgeons for inpatient and outpatient services. 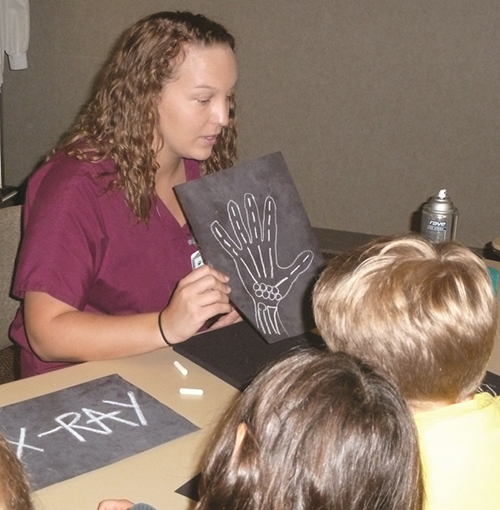 We provide a full spectrum of imaging and diagnostic radiology services for children of all ages through age 18. The Pediatric Radiology Team includes board certified Pediatric Radiologists, and specially trained technologists and nurses. Our Pediatric Radiology Nurse is always on-call to take questions from parents prior to or after a medical imaging study or procedure has been done. If a child is extremely anxious, fidgety or claustrophobic, PMCH has a Pediatric Sedation Service group who assists by calming the patient, educating the family and using safe sedation to prepare the child for a medical image study. The Child Life specialists at PMCH are also adept at playful distraction and soothing our young patients to get best result possible during important testing. The PMCH Pediatric Radiology Department is very safety conscious and will always identify the best approach to diagnostic testing and treatments using radiation-based technology. We offer a Safe Kidney Program that screens all patients for kidney health and function before contrast is administered, and we avoid multiple scans. While some of our patients require routine scheduling of medical imaging for active surveillance of a medical condition, in all cases, we utilized the least amount of radiation needed to get an adequate image. For example, throughout St.Vincent Health we follow the most up-to-date CT scan protocols for children and adults.